Sadly, I started writing this post on May 10th, and here we are in July -- and my message is still relevant (if not more necessary in light of the very real domestic terrorism being levied against Black people in the streets and in houses of worship). Repeating "this has GOT to stop" and "what year is this again?" to myself doesn't help anything, so I sat and thought about what we as a community connected through mutual appreciation and affirmation of our own beauty, can do in light of these tragedies. The past few years have been difficult to digest, to say the absolute least. The very real open season on our unarmed Black boys and girls leaves many of us feeling frustrated, disgusted, and sometimes hopeless. I've been doing some thinking lately, because there's one question that comes up every time another Black body is taken down in cold blood by an officer tasked to "protect and serve" -- what do we do? What can we do? To create real change, our response strategy needs to be long-term, multi-faceted, and unapologetic. Growing up in the wake of the LA Uprising, I became all to familiar with the push to "Recycle Black Dollars". In 2015, that mantra rings even more true. When it comes to creating a strategy to affect change, economic power must be a cornerstone. Because of the natural hair boon, we are uniquely situated to demonstrate what this looks like on a small and large scale. 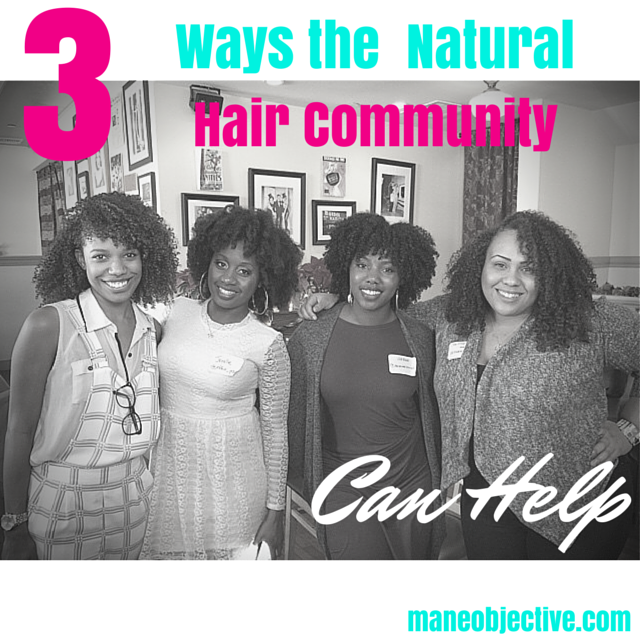 Since the natural hair care industry took off around 2009, we've seen how Black women have been able to capitalize (and not in a bad way...for the most part) off their own experiences in the beauty industry and create blogs, YouTube channels, haircare lines, salon, media outlets, event planning agencies, and more. Truly, I'm heartened by it all. The onus is on us as consumers and supporters to keep this momentum going and ensure that we're reinvesting some of our capital into Black-owned businesses with ethics and values that align with our own. I'm still waiting on a Black-owned chain grocery store, but in the interim I can at least make sure that I support Black owned small businesses, and those brands that have made it to the shelves of major stores like Target, Sally's, and Sprouts. In Luvvie's rant, she said three words that resonated with me: Everybody ain't able. I'm gonna take this a little out of context just to disagree with her -- everybody is able. Know the law? Share statuses, updates, write blog posts, print flyers to distribute, etc. -- get the word out about rights, legal terms, what to do if you're pulled over, etc. If you're a writer, write. If you want to donate to cover final expenses of affected families, do that. If you're a teacher, teach. Incorporate culturally relevant topics into your curriculum (as much as you can, and appropriate as far as grade level). Parents, talk to your kids. Artists, create art that sparks conversation. Social media maven? Tweet, Snap, and do it for the 'Gram. Financial analyst/planner? Share that information so we can get our wallets and bank accounts together. Everybody has a unique gift and talent. And if purposed for good, we can really begin to turn the tide collectively. Not everything has to be a rally, march, or protest. Taking small steps now can benefit us more than trying to take one giant leap in the future. This is just my two cents. What are your thoughts on things we can do now to create change?